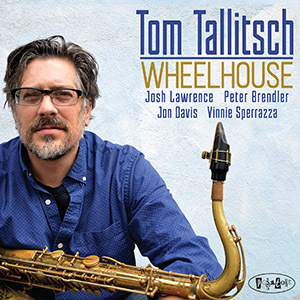 Wheelhouse is Tom Tallitsch’s fifth outing for Posi-Tone Records (eight overall) from one of the most consistently solid performers in that label’s stable of quality jazz performers. Though this 2018 release again sees the tenor sax master heading up a roster who have led their own notable dates for the label, but this one pairs Tallitsch with a trumpeter for the first time on a Tallitsch record, in the form of the talented Josh Lawrence. Also on board is Jon Davis (piano), Peter Brendler (bass) and Vinnie Sperrazza (drums). Combine the proven quintet format with Tallitsch’s penchant for penning memorable post-bop and hard bop tunes in the classic style, and Wheelhouse is akin to Blue Note pulling out a vintage mid-sixties session from the vault performed by label heroes Paul Chambers, Donald Byrd, Herbie Hancock and the like. Even the spotless, analog-warm production by Marc Free evokes Rudy Van Gelder. Though Tallitsch has been known to throw out an offbeat cover or two in the past, he sticks to all-originals this go around. “Wheelhouse” features a tale of two rhythm patterns, but when it settles into a swing mindset, Tallitsch displays that ingratiating, soulful tenor in full . Not one to leave a wealth of talent idle, Davis, Lawrence and Sperrazza get their own savory features as well. “Schlep City” is a blues-based shuffle where Lawrence’s trumpet spotlight more than recalls Lee Morgan. Sperrazza’s dynamic rhythm-ing drives “Red Eye” along as Tallitsch and Lawrence combine for funky lead lines prior to them taking turns on thoughtful solos. Brendler’s bass pattern kicks off the slow swinging “Paulus Hook,” which has a melody imbued with melancholy nicely captured by Tallitsch’s aside. “One For Jonny” is a tender ballad, a choice opportunity for Lawrence to show off a lavish affecting tone. He later fills in some harmony behind the leader’s own heartfelt solo. To top it all off, the swaying soul-jazz of “Gas Station Hot Dog” hearkens back to the RnB-soaked numbers once championed by Morgan and Lou Donaldson, and Davis’ crisp lines here as they are everywhere else are delightful throwback to when jazz piano was played with a lot of soulfulness. Tom Tallitsch’s Wheelhouse is all in a day’s work for this underappreciated tenor saxman, who once again demonstrates the continued vitality of the hard bop form. If that kind of jazz is in your wheelhouse, then this album is sure to be as well.